Learning how to clean artificial grass is key to boosting its lifespan. You installed your new lawn because you want a yard that looks great all year long. That’s why some degree of upkeep is needed. Luckily, when you know how to clean artificial grass, you will find out it is a lot easier than maintaining a grass lawn. At Watersavers Turf, we’re happy to offer advice on how to clean artificial grass, and can suggest products that make faux lawn care easy. Want to enjoy your lawn without sneezing nonstop every time you go outside? Switch to allergy free synthetic turf. Pollen and other allergens build up quickly in live grass. With allergy free synthetic turf, a little bit of rain will wash them away fast. On a grass lawn, water doesn’t drain easily, so allergens don’t wash away easily either. Fake turf lawns, however, drain quickly. Removing Allergens: Pollen from nearby plants will wind up on your lawn from time to time. If it hasn’t rained in a while, these types of allergens can accumulate. A quick spray with the garden hose will remove them quickly. Cleaning Lightly Soiled Areas: If you come across any areas that are lightly soiled, mix warm water with a 5% solution of household detergent. Sponge mop the area, then give it a rinse. Simple as that. Cleaning Heavily Soiled Areas: If an area is more heavily soiled, follow the steps listed above. Then, sponge mop the area with a 3% solution of household ammonia and hot water. Rinse the spot once you’ve finished cleaning it. 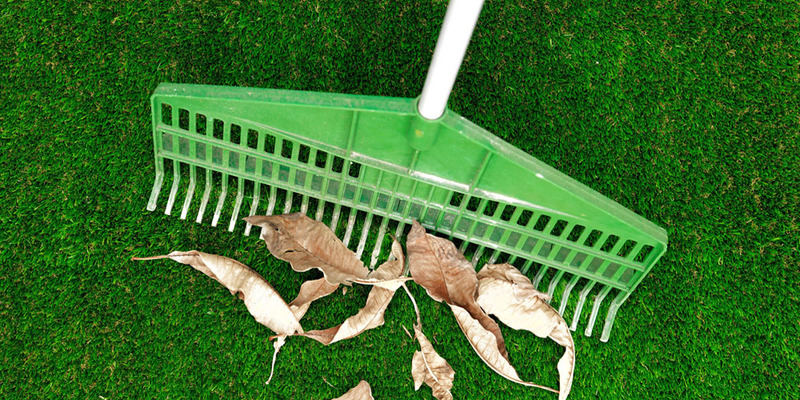 Tools: Use a spatula or plastic table knife to remove hard or “pasty” deposits on your lawn. Just be careful not to damage the turf fibers. Blot up small liquid stains with a paper towel or washcloth. You can also cover them with a dry absorbent product like kitty litter. After it’s absorbed the liquid, vacuum or sweep it away. Then, rinse your turf to get rid of the kitty litter scent. Treating Minor Blemishes: A 5% solution of warm water and household detergent is all you need to remove most minor stains. Use one teaspoon of detergent for every pint of water. The detergent should be granular or low-sudsing; the kind you would use on fine fabrics. Tougher stains may require a 3% a solution of ammonia and water. Both these solutions can be applied liberally to your lawn. Just blot up excess liquid when you’re done sponge mopping the area. Rinse away any remaining soap or ammonia with cold water. These solutions remove a wide range of stains, including these common ones: coffee, tea, ketchup, fruit and vegetable juice, alcohol, butter, latex paint, blood, urine, mustard, glue, butter, soda, milk, ice cream, and even dye. Treating Tougher Blemishes: Sometimes you may need a stronger cleaner to remove a blemish. In these cases, you can use mineral spirits or grease spot remover (like dry cleaning solution). Don’t sponge mob with these substances. Instead, lightly soak a washcloth then carefully apply to the stain. These type of stain removers are ideal for the following: chewing gum, cooking oil, asphalt, tar, lipstick, crayon, grease, motor oil, floor wax, shoe polish, ballpoint pen ink, paraffin wax, suntan oil, and nail polish. Caution: Avoid using products that contain chlorine bleaches or caustic cleaners (pH above 9), as well acidic cleanses (pH below 5). When using mineral spirits or petroleum-based solvents, keep them away from lit cigarettes or open flames, as these substances are flammable. You also want to make sure they don’t get below the turf surface. They could damage the layers beneath the blades. Wait for Waste to Dry: Don’t remove any animal droppings until they’ve dried. You’re less likely to spread waste around the area if it’s dry first. Rinse Regularly: Keep your lawn surface hygienic by rinsing it with the hose on a regular basis. This promotes animal urine drainage. Rinsing your lawn often is especially important in regions that don’t get a lot of rain. Use the Right Infill: Keep your lawn free of pet urine smells with ZeoFill Organic Infill. This infill uses natural processes to stop animal odors before they start. We also offer FreshCut Scent. With this product, your lawn will smell just like freshly-mown grass. Tree Sap: If sap gets stuck in your lawn, purchase some aerosol refrigerant from a carpet-cleaning supplier. You can also use dry ice. Freeze the sap, then scrape it away. This process also works for chewing gum if mineral spirits or grease spot remover don’t work. Fungus or Mold: Apply a 1% hydrogen peroxide in water solution with a soft sponge to any fungus or mold you notice. Then, slowly and carefully clean it away with water. Oil Paints: Discuss tougher stains (like those from oil paints) with a Watersavers Turf expert. You may need to use a commercial carpet cleaner. We’ll recommend the right product to clean your turf safely. Your turf might get a lot of foot traffic. That’s why you should know about the benefits of cross brushing fake turf. This process simply involves brushing against the grain of the turf. The benefits of cross brushing fake turf are clear as soon as you do it; the blades will stand upright, instead of looking matted. To get the full benefits of cross brushing fake turf, use a brush with synthetic bristles. Metal or wire bristles can damage your plastic grass. Don’t smoke near it. A lit cigarette could damage the fibers. Keep furniture with sharp edges away from it. They may puncture the surface if you’re not careful. Don’t let parked vehicles idle on the lawn. A car may leave behind auto fluid stains. Remove or cap off sprinkler heads that can spray onto your artificial turf. Over time, they may leave mineral deposits that can stain your lawn. Avoid turf burn by applying tinting (40% darkness or more) or screens on the outside of windows that directly reflect onto your plastic lawn. Window screens are preferable since they are seven times more efficient than protective films. Installing them prior to turf installation is especially important if you have energy efficient windows. These kinds of windows have a high-performance glaze on them that allows sunlight in. However, this coating encourages radiant and solar heat to bounce off onto the surfaces where the rays touch. This can cause your turf to burn even though it has a very high melting point of 175F to 200F. With a little care, a synthetic lawn can keep your property beautiful for years. Watersavers Turf, premier artificial grass distributors, are here to help. Stop by one of our SF Bay Area locations to discuss your project. You can also call us toll-free at 844-974-8873, or chat with us online for more info. Be sure to ask about our free estimates, samples, and delivery offers too!